It's the final day of the challenge? Are you guys sad? I'm a little sad, to be honest! I won't miss the pace of the challenge, but it really did push me and get me to create some work that I'm really proud of. I'll do a roundup/summary type post tomorrow or the next day. So, the final prompt was "recreate a manicure you love." This is the only prompt of the challenge that I've had planned the whole time. 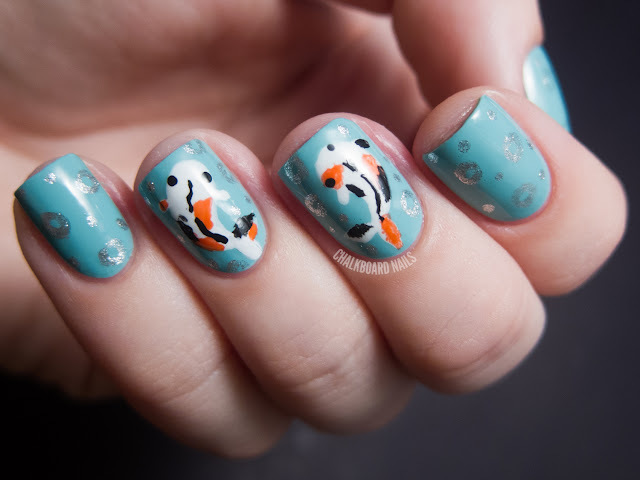 For my manicure, I recreated Mr. Candiipants' koi fish nail design. You can check out a tutorial for this design here. Seriously, since the moment I first saw these nails I have wanted to recreate them. I was glad to have the chance to work this into the 31DC. For the base, I used China Glaze For Audrey. 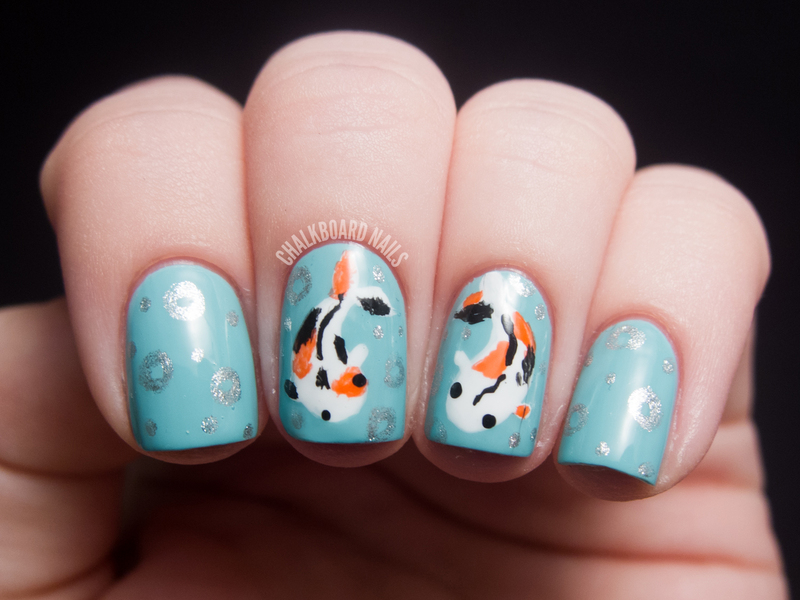 The body of the fish was done with OPI Alpine Snow, OPI Black Onyx, and theBalm Orange You Glad You're Not Blue?. The silver bubbles were done with Wet N Wild Silvivor. The little chubby fishies are just too cute to resist. Thanks for creating this awesome design, Candice! Last year's nails for this prompt can be found here. If you'd like to try the challenge yourself, you can find the prompts here. Check out my 31 Day Challenge 2012 Pinterest board to see all of my challenge manicures together! You can also look at my 2011 31 Day Challenge set on its own Pinterest board, too. wow congrats you made it through all 31 days!! I don't know how you find the time! lol Amazing as always! This is my favorite! Is it possible for you to make a tutorial on them? 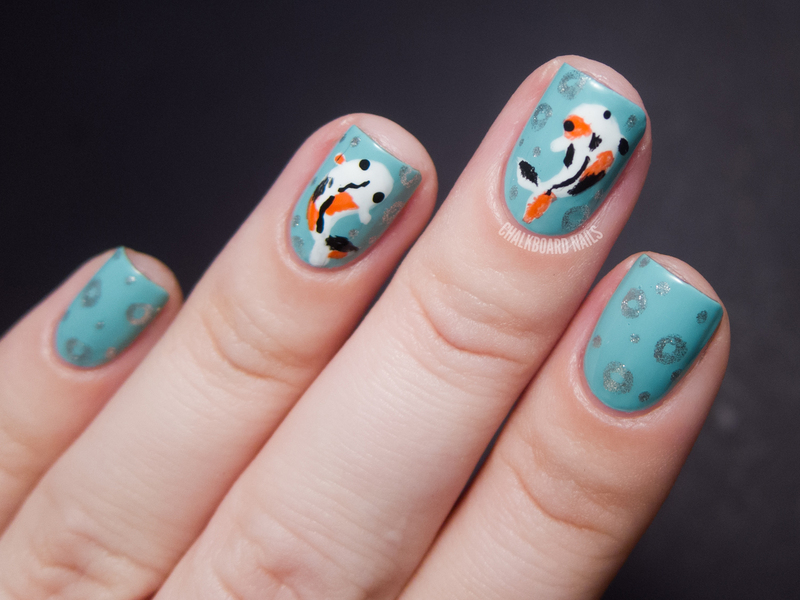 I'd like to have little fishies on my nails! Hi Katie, I linked Mr Candiipants' tutorial in my post. Check it out there. awesome work :D love the colour combination! Cute! BTW,love your theme, too! I've been wanting to try this tutorial too - they look great! This challenge was fine. I participated and I had a lot of fun. 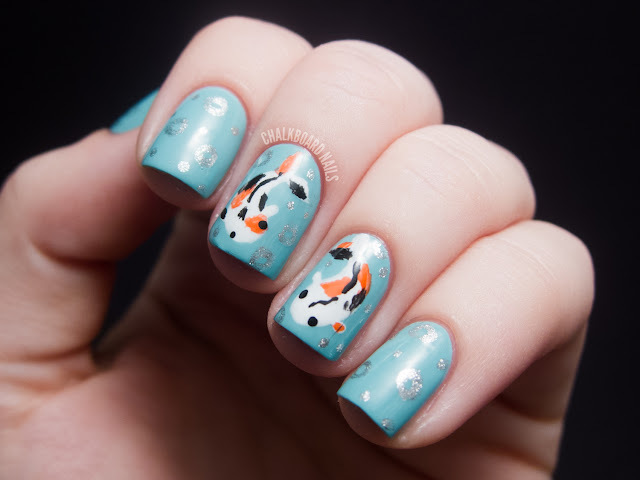 This manicure is really wonderful... these fishes are so cute! These are wonderful, I love them. Great job on completing that challenge. Way to stick to it! I know I how much work that must have been. Oh my goodness, this is just too cute! You did a fantastic job! Congrats on completing the challenge and ending with a great mani! So perfect and precise, love the detail in this! Squee!! This design is adorable! Love the little silver bubbles hehe. Soooo cute! 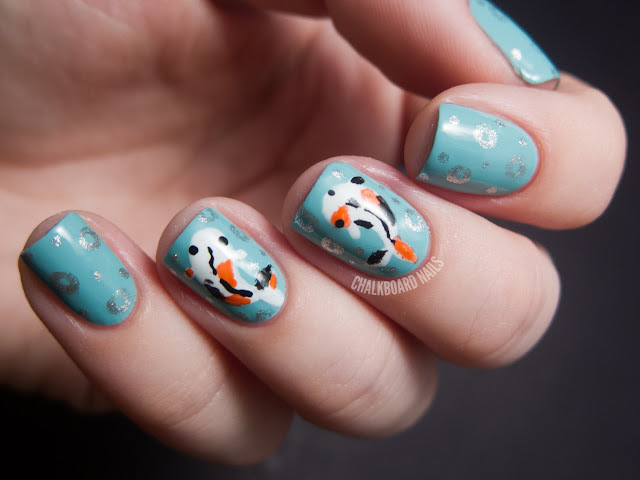 The background colour is really great, and the fishies are so cute! I did a koi design on a nail wheel a while back but I still haven't gotten around to doing it on my own nails! So pretty I love fish lol! Flip one of those fish and this could easily have been a Pisces design. It's absolutely beautiful.